It had been a warm humid “Indian summer” kind of fall day when one remembers the warm days of summer, and there was a lot of excitement in the air with the third game of the first ever World Series between the two local teams, the San Francisco Giants and the Oakland Athletics. The world was watching the Bay Area and everyone, not only baseball fans, everyone was a buzz. Most businesses closed early so employees could be at home, or with friends, if they weren’t partying at one of the many bars and restaurants that were hosting World Series events. The roadways were less crowded than they would have normally been on a Tuesday afternoon in October since the game started at 5pm. Everyone in the Bay Area was glued to a television somewhere watching this exhilarating game, when the world stopped and changed forever for those involved. It was 5:04pm on October 17, 1989.
that the game had been postponed, as he was so upset when he thought that he was missing his beloved Giants. Fifty-one aftershocks of magnitude 3.0 and larger occurred during the first day after the main shock, so the first night, many people slept in their cars in the field at CT English Middle School (that field is now behind the new Loma Prieta Elementary School). What news we got concentrated on the Cypress Street Viaduct, a one and a half mile section of Interstate 880 (The Nimitz Freeway) in Oakland where people were trapped in their cars on a double decker freeway that had collapsed killing 42 people. A 50 foot section of the San Francisco-Oakland Bay Bridge had also collapsed causing two cars to fall, killing one person. The Marina District in San Francisco, that we were going to find out was built on fill, had became like a bowl of Jell-O, vibrating so much that buildings collapsed, tumbling into their inadequately reinforced first floor garages, trapping and crushing six people or burning them in the ensuing fires. 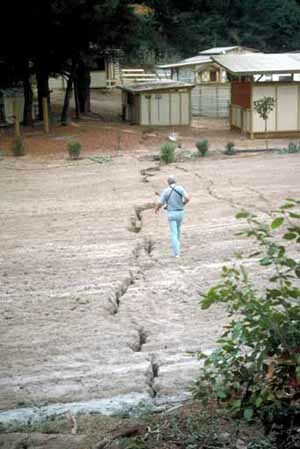 In the months to come, we would hear about liquefaction of soil where the earthquake’s shockwaves rippled the ground more severely. The Pacific Garden Mall, downtown Santa Cruz had a significant number of historical buildings with brick facades of unreinforced masonry walls where falling bricks and debris killed three people. 31 buildings had to be demolished, seven of those were on the Santa Cruz Historic Building Survey. Six more people perished in Santa Cruz County bringing the total to 63 people dead and 3757 people injured, but no one in the Santa Cruz Mountains was killed, or seriously injured. 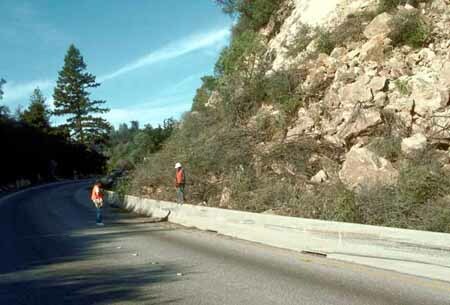 It wasn’t until day two that the US Geological Survey announced that the epicenter was in the Santa Cruz Mountains, in the middle of the Forest of Nisene Marks State Park in an unpopulated area of the Santa Cruz Mountains in the shadow of a 4000 foot elevation mountain named Loma Prieta. (geographical coordinates 37°02′N 121°53′W37.04, -121.88) They decided to name the earthquake after our mountain and the eyes of the world shifted to our small mountain community of 4000 homes, and the press descended upon us. The earthquake measured 6.9 on the moment magnitude scale with a surface-wave magnitude of 7.1. Because the World Series was being broadcast throughout the world, this was the first major earthquake to be caught on camera and broadcast on live television worldwide. It is supposed to have lasted for 15 seconds, but it seemed much longer to those of us on the mountain. 16 more aftershocks occurred during day two. The Red Cross brought in food and other necessities, as well as providing a place to just sit down and stop for a few minutes. Networking became an important issue and finding out how friends had fared helped everyone cope with the shock of what they were experiencing. FEMA (Federal Emergency Management Association) and the county building departments from both Santa Clara and Santa Cruz Counties set up tables in the community center and we waited in long lines to talk with them about getting help to get back on our feet. The power was out to most mountain residents for the first four days and the phone lines were jammed with calls. Cell phones had just become available and were very expensive, so few people owned one. They did work, if you knew someone with one. Day four, it rained. Not hard, just enough to damage homes that were split open and damage possessions that had been removed to the “safety” of the outside. It also drove those who had been sleeping outside, inside. By now, Highway 17 had been cleared enough to allow one lane each way to open. Long, long lines wound all the way into San Jose as police checked identification from each car in an attempt to keep sightseers and pillagers out. When the power came back on, everyone was able to start cleaning up and begin healing. Pacific Avenue, downtown Santa Cruz was a mess. Buildings had to be demolished, relocating businesses into tents in a nearby park for months until virtually all of the downtown was rebuilt. In the first ten days, 78 magnitude 3.0 and larger aftershocks occurred, as well, shacking the nerves of the already traumatized residents. The earthquake was the largest to occur on the San Andreas Fault since the great San Francisco earthquake of 1906 and the most severe in California since the Kern County earthquake of 1952. It was felt over most of central California and in part of western Nevada, causing $6 billion to $13 billion in property damage, becoming the most expensive natural disaster in United States history, to date. 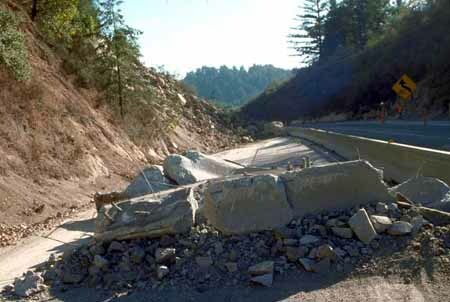 The rupture occurred on a 30-mile length of the San Andreas fault called the Santa Cruz Mountains segment. The epicenter was eleven and a half miles underground at a spot near China Ridge in Nisene Marks State Park. The land on the seaward side of the fault slipped five and a half feet northwest. 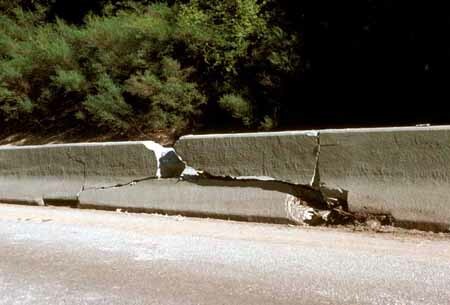 The San Andreas Fault is considered the main boundary between the Pacific and North American Plates. It runs through San Juan Bautista, the Santa Cruz mountains, north through the San Francisco Peninsula, off shore from the Golden Gate, and then on-shore just east of the Pt. Reyes Peninsula. It has taken years for our community to recover from the earthquake. The local store, La Tienda (now Summit Store), had to be completely rebuilt requiring years of negotiation with the County of Santa Cruz to permit it to stay in the same location. Loma Prieta Elementary School was condemned requiring the students to be moved across the street into portable classrooms located in the parking lot in front of the community center. A four inch crack separated Mrs. Osborne’s first grade classroom into two sections, requiring her to crawl out a window to safety that fateful night. A third of the homes on the mountain were either completely destroyed or damaged enough to require extensive work. Low interest loans were offered by FEMA, but rebuilding was slow, trying to maneuver through the sea of county requirements took a full time job. Both county building departments had been notoriously difficult to deal with and they were true to form in this situation. 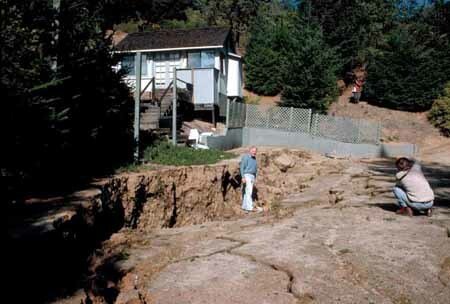 Many people fought for the right to rebuild and they tried to condemn the Villa Del Monte community of 125 homes off of Summit Road, saying it rested on an ancient landslide. 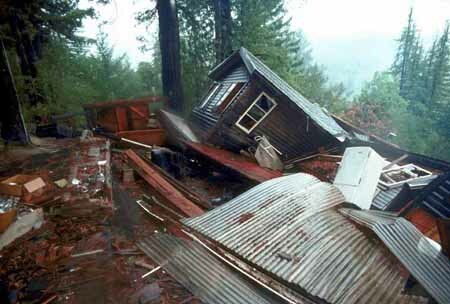 The Redwood Estates Pavilion was destroyed leaving the water board with years of struggle to get the facilities rebuilt and their water system was so badly damaged that San Jose Water Company ran pipes up and now services there community. Gone were the little old cabins and homes, and the look of our community changed as new, larger replacement houses were built, attracting a more affluent person to our mountain community. Twenty years later, the homes have been rebuilt and the earth has been mended—only memories remain in the minds of the survivors. Thanks to the United States Geological Survey (USGS) for the photographs and statistics used in this story.